DewPuff is made from fiber of an Asian root vegetable called “Konjac”, and water. The beautiful simplicity of this facial sponge is that it contains only two ingredients. For thousands of years, Japanese people have been eating a jelly like food made from this konjac fiber called “Kon-nyaku”. The dietary fiber made from konjac fiber (which is the main ingredient of kon-nyaku food) has an amazing ability to retain water. This makes konjac fiber an ideal ingredient for moisturizing facial sponges. 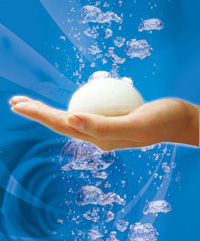 DewPuff, armed with konjac dietary fiber, is very moisturizing when soaked in water. Gently massaging skin with a moist DewPuff is refreshing and provides a unique exfoliation effect to skin. Also of note is that the konjac sponge itself is weak in alkaline. When soaked with water and softly applied to the face, the konjac sponge will form a weak alkaline layer of water between the sponge and skin. This layer of weak alkaline water naturalizes acidic substances on the skin and allows them to wash away harmlessly without the use of soap providing a soap-less cleansing benefit. DewPuff is perfect for cleansing infants, for teenagers suffering from acne, and for people of all ages who value an all-natural scrub for the face and other sensitive body parts. Boulder Trading offers DewPuff in three different colors—White, Black and Asian Clay. The white puff, is the original pure sponge made only from konjac fiber and water. The black puff includes a natural bamboo charcoal powder ingredient which provides extra bacteria fighting power. And lastly the orange colored “Asian Clay” puff, offers natural Asian yellow soil powder known for boosting absorptive power to the puff. For more info, please visit www.dewpuff.com.